The FSL tests the mettle of the best teams in all worlds every season. 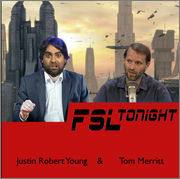 FSL Tonight takes a weekly look at all the games of the week giving you scores, highlights and inside info. Check back every week to find out the scoop with hosts Justin Robert Young and Tom Merritt. Big thanks to Scott Johnson of the Frogpants Network for the Dragon SportsTalk Radio stinger and the FSL dragon logo. Enormous thanks to Paul Wheatley who made the “shield style” FSL logo. Also thanks to Mark “Turpster” Turpin, Veronica Belmont, Len Peralta, Iyaz Akhtar, Storm DiCostanzo, and Paul Sabourin for contributing to the upcoming shows. The theme music is The Big Boom by Jonathan Coulton, issued under a Creative Commons license, and used in accordance with that license. We also told him we’d be using it. He’s really nice about these things, so go buy it. Team logos designed and submitted by FSL Superfan, Phil Meadows.